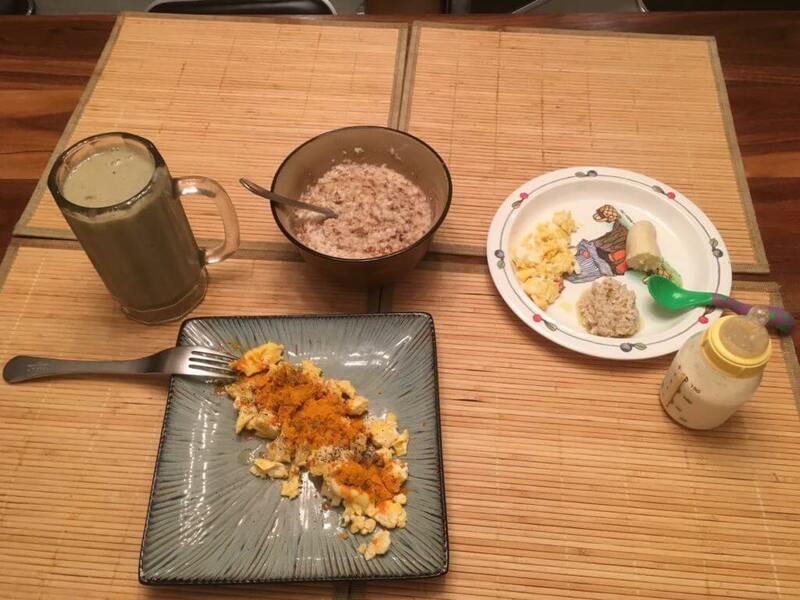 Scrambled eggs, steel cut oatmeal and a shake. The shake is comprised of cashew milk, banana, berries, flax meal, wheat grass and unflavored pea protein powder. The Oats have cinnamon ( to help regulate blood sugar levels). The little plate on the right is for my 1 year old son. His bottle has goat milk instead of the shake haha and the eggs only have some olive oil on them while mine have turmeric, pepper and some franks red hot. A good idea when trying to conquer your diet / food intake and start building your nutrition for exercise, is to find a healthy meal that you like and repeat that meal each day. Eating the same thing at the same times can help you stay on track.